Click Here to See the Message of Appreciation Jon-Erik wrote in JP's Yearbook! John Patrick Mullin, whose generosity provided us with most of the content on this website, passed peacefully from this life on Friday, November 21, 2008 at the age of 72, of heart-related complications, while at home, sitting at his desk. A man of gentleness, wit and great joie de vivre, he graciously corresponded with many of Jon-Erik's friends and fans on recycled paper adorned with tiger decals, long after Hexum's passing. No retrospective of Jon-Erik's life would be complete without a nod to the man who inspired so much of it: JP, as he liked to be called, had a contagious enthusiasm for life and people, which no doubt rubbed off on Jon-Erik early on, and was undeniably a catalyst in Hexum's transformation from awkward high school student into Mr. Everything in his senior year. Jon-Erik frequently stayed at the Mullins' Park Ridge, NJ home after his graduation from Michigan State University, even borrowing JP's car on occasion to make his Manhattan auditions. JP assumed no airs, but could quickly take control of any room he walked into with his earthy style and Irish charm. In his latter years, JP made extra bucks helping kids craft their own teddy bears at the Paramus Park Build-a-Bear Workshop. 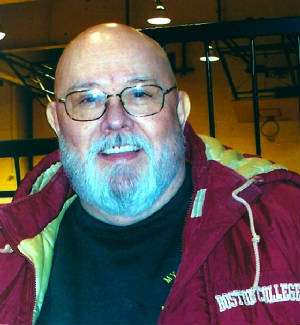 He was happy to take part in all kinds of activities in his spare time, whether it involved calling wrestling matches, acting in school productions, or dressing up as the Tenafly High tiger mascot. A native of Manhattan, JP moved to New Jersey at a young age, where he attended Tenafly High School. A protegé of the late coach Eugene "Red" Littler, Mullin excelled in football and other sports, accomplishments for which he was inducted into the Tenafly High Athletic Hall of Fame. After college, he returned to Tenafly High as a teacher of world history, from 1968 until 2002. Mullin was immensely respected and liked by his students, and without that deep and sincere devotion he felt for them, the actor we know as Jon-Erik Hexum might never have been. JP is survived by his wife, Jeanne, their sons, Sean and Michael, as well as two sisters, Patricia Perry and Florence Spies, and a brother, Robert. A toast to you, JP! Though you're with us no more, a part of you will always be around! itself as we go about the business of everyday living.